The way the Louis heel, still a staple of high-end women’s footwear, is attached to a sole has remained unchanged for over 300 years. Its history during that time is fascinating. The future for virtual sampling? INESCOP’s ICad3D+ system gives users the ability to create virtual shoe prototypes from scratch. It allows for the footwear design and development process to be considerably accelerated. There are a variety of reasons why some women prefer to wear high heels. Changes in foot shape, likely caused by a growing preference for trainers, are forcing designers to rethink how they are made. The myriad of falsehoods peddled by anti-meat campaigns inevitably end up filtering down into the leather industry. The reality, however, is that global meat consumption continues to grow and that leather is still the best use for animal hides. Susterra propanediol from DuPont Tate & Lyle Bio Products can serve as the building block for high performance bio-based polyurethanes. A number of brands have incorporated Susterra-based materials into their products. The author of the World Shoe Review says Asia is still hugely dominant in global footwear production, with 80% of the total, but may now have reached a ceiling. Sympatex believes its Utmospheric technology, which moulds a footwear liner to the shape of the foot, presents a new solution to an old problem: how to put membrane technology into shoes without puncturing their ability to protect. Last manufacturer Fagus has begun making its products available to designers, manufacturers and brands through an online shop. It says it wants to make a contribution to reductions in lead times. A production model that places people alongside robots on the factory floor is gaining in popularity. And if your co-worker is a robot, it makes more sense to call it a ‘cobot’. Researchers in Portugal are using new materials, including ultralight microcellular polyurethanes, to produce ‘extra light’ shoes. A look at the fashion trends that have made an impact on men’s footwear through the ages. Leather’s dominance of the footwear market appears to be at an end, perhaps because the shoe industry has adapted to meet the challenges of today’s world better than the leather sector. A study by SATRA has shown that more than 40% of men in the UK are buying shoes that are one or even two sizes too big to secure footwear of a suitable width. An alternative to upper stitching? The previous issue of World Footwear contained an article by CTCP that included details of a new construction from Spanish company Simplicity Works that assembles the upper and completes the shoe using injection moulding. The possibilities of the process are such that it is worth taking a further look. Thermoplastic elastomers are among the materials to have come to the fore with the rise of athletic footwear. Portuguese research organisation CTCP is working on a series of new concepts that it believes will help shoe brands increase their ability to offer consumers customised footwear. An examination of the pros and cons in using steel or composite material to make protective toecaps for safety footwear. Polymer producer Covestro has developed an adhesive filament that it says will adapt well to fused filament fabrication processes. A twentieth-century timeline of safety shoes and boots, from clogs with iron rims to Chukka boots. Moulds as well as lasts are now available from manufacturers such as Fagus, who are seeking to provide their customers with “the total package”. Fascinating factory visits and a detailed and varied conference programme made the Porto event a great success. European regulation (EU) No 1272/2013 has now been in force for over two years, restricting polycyclic aromatic hydrocarbons (PAHs) in some rubbers and plastics depending on their end use. But, why are they restricted, which PAHs have been detected in consumer products and where could they be found? A partnership involving Brooks Running Company, insole manufacturer Superfeet and technology from the FitStation project and Desma will deliver a new, highly customisable (but limited edition) shoe called the Genesys. New ideas are needed if leather is going to fight off the increasingly strong challenge from synthetic alternatives and regain its place as the material of choice for the footwear industry. It’s only natural for parents seeking information on children’s foot health and how shoes affect it to turn to the internet. Researchers at Brighton and Salford universities argue that brands must bear this in mind and make reliable data available online. A pictorial account of what children’s shoes used to look like, courtesy of the Bata Museum in Toronto, an outstanding legacy of the late Sonja Bata. Spanish research bodies have experimented with plasma and laser treatment to modify leather and add functionality but without affecting its appearance. Medieval guilds can seem restrictive to the twenty-first century eye, but they controlled quality and costs and protected shoemakers from unfair competition. It can be tempting to cut corners on testing children’s shoes because young feet grow so quickly. SATRA insists that there is no segment for which testing should be taken more seriously. A range of factors influences the level of comfort a shoe offers. Women’s fashion footwear is especially prone to “comfort compromises”, which can cause the wearer discomfort, ailments and injuries. Sergio Dulio reports on the Mass Customisation and Personalisation Conference (MCPC), which took place in November in Aachen, Germany. It comes at a time when mass customisation is finally becoming a reality in the footwear industry. The key to an elegant women’s court shoe is a well cut topline and there are three major construction methods that can be employed to achieve this. What they have in common is the need for a topline tape that possesses a unique combination of physical properties. A study has shown that waterborne polyurethane technologies, such as Covestro’s INSQIN, can offer a more environmentally sustainable solution for the production of PUCFs. Biofabrication of materials that mimic leather may give footwear manufacturers some interesting options, not least because the material can be produced on sheets. Children’s footwear produced in 2017 by advanced materials developer Sympatex carry a certificate to show they are climate-neutral. Sergio Dulio highlights RAMS, a new manufacturing solution that aims to maintain ‘relevant roles’ in the footwear factory to highly skilled people. Replicating muddy conditions to test the anti-slip properties of outdoor shoes and soling solutions is notoriously difficult, but testing organisation SATRA has developed a new material to make testing easier. The shape and materials of orthotic insoles help make this hidden product a crucial tool for manipulating where load is applied under the foot, Professor Chris Nester from the University of Salford explains. Robotic application of adhesives in the shoe factory will help the industry adapt to the demands of Industry 4.0. European standards for personal protective equipment have much to say about the role of shoes in keeping first responders safe. Adhesive films are proving versatile in the shoe factory, while also offering savings in labour, waste and energy. Shoes made from Shell Cordovan leather are expensive but, with a little care, will keep their beauty for years. Price counts, of course, but Steve Rose of SATRA explains that strength, durability, comfort and ease-of-use in the factory must all be key elements of any footwear manufacturer’s materials selection strategy. Shoe component manufacturers are doing the world a favour by putting troublesome algae that form on lakes to commercial use; they can serve as raw material for foam production. With digital manufacturing and Industry 4.0 now making headway, Sergio Dulio says it’s time to consider how the latest developments in 3D printing will affect the footwear sector. New machinery makes small-scale CT scanning of manufactured products, including footwear, a realistic prospect, according to SATRA. Useful for checking that shanks and inserts are in the right place. New rapid monitoring methods, highlighted by CTC, will help footwear manufacturers detect mould before it hits the surface of shoes. As the prospects for using nanomaterials in consumer products increase, research institute INESCOP insists testing for potential toxicity is more important than ever. Footwear construction is complex these days but, as this paper from Spanish technology institute Inescop argues, a large number of different elements offer wide possibilities for adding function­ality, including antimicrobial properties. A strong and long-standing relationship with tanning group Dani gave Italian outdoor footwear brand Aku a head-start in using a new chrome-free leather called Zero Impact. Working with a diverse set of industry partners, Portuguese research institute CTCP has launched a project to find more sustainable materials and manufacturing methods for footwear. Texas-based Austin Rubber is upcycling rubber from used tyres to make shoe soles. The special construction of veldtschoen-type shoes, whose popularity dates back to the nineteenth century, has much still to teach us about how to make shoes water-resistant. Portuguese footwear group Kyaia is working with partners, including the Portuguese Footwear Technology Centre (CTCP), to add even smarter data-connecting technology to its earlier high-speed shoe factory project. German research institute FILK has been examining ways to make eye-catching designs for high-heeled shoes as wearable as possible. Shoe brands’ ability to comply with product safety regulations requires good relationships with partners along the entire supply chain, SATRA argues. Tanners have long assumed that shoe manufacturers would always need leather, but the relationship has begun to appear more fragile. What’s the future for manufacturing? Athletic shoe brands are investing heavily in the most advanced technology they can find to make their footwear production as futuristic as possible. The footwear industry is moving towards the fourth industrial revolution, Industry 4.0, in which machines and people share information and digital and physical processes blur. A breakdown of global footwear production focusing on full-year figures for 2015, when the industry suffered a 3% downturn. Accurate knowledge of the development of children’s feet during the different stages of their development up to adulthood forms the basis for the perfect children’s shoe and the last on which it is made. Footwear research centre Inescop has established a new method for scanning the foot, with the data connecting to an archive of digital lasts to let consumers know which lasts, and therefore which shoes, will provide the closest match to their feet. When infants take their first steps it is an important milestone for families. It also poses many questions about foot development, footwear and how best to protect and support the growing foot. A significant challenge is just how little we actually understand about how feet develop. Sports footwear forms an important sector in the industry not only in terms of the quantities involved but also in terms of the technological and marketing developments which give footwear as a whole, a higher profile. Stockings and shoes must be considered as a combined system and it should be possible to improve the properties of the system and achieve noticeably better comfort for the wearer. Desma is one of the best known machinery names in the footwear industry. From humble beginnings in the aftermath of World War II, it has become a major supplier of sophisticated moulding machines and automated systems worldwide. Main Group is now starting to fit the new proportional system to all its PU machines. End of the road for EVA? EVA (ethylene-vinyl acetate) has been the material of choice for sports shoe midsoles for more than 30 years. Over the same period, sports shoe brands have constantly sought to find ways to differentiate their products in terms of performance from their competitors in a cut-throat global market. The rapidly changing face of retail and of the footwear industry, there is a paradigm shift in how footwear is being sold. The high streets and shopping malls, with their multiple shoe retailers, are fast giving way to internet search engines and online businesses willing to provide a broad range of products delivered to the customer’s door in 24 hours or even less. The result is a generation of consumers who increasingly no longer connect with the sensory aspects of leather and what it has to offer. Safety footwear is one of the very few types of footwear which has to meet fairly demanding requirements in terms of national and/or international standards. There has to be a commitment on the part of the producer and supplier to have the products tested and certified by a recognised body. While Perspair will not be suitable for many types of footwear, it certainly offers some real possibilities for specialist footwear producers aiming at the extreme sports and certain sections of the safety markets. Asewing thread is built up from yarn twists that consist of at least one or, more usually, two or more yarns. How this has been done determines its final properties which are specified by several factors. Leather has been the prime shoemaking material for a very long time. Modern technology can help us to use our resources wisely and differently. This was the central theme of the Future Footwear Materials Conference organised by SLEM at Waalwijk, the Netherlands, in partner - ship with Jakajima, the matchmaker for innovators in high tech industry, this April. The possible combinations of point shape, angle and size of sewing needles is in fact immense and selecting the best option depends on the materials to be sewn, their thickness and the nature of the finished product. Stitching forms a vital part of the construction of most footwear and threads are therefore a key component. Last year, European Regulation 301/2014 came into force restricting Chromium VI (hexavalent Chrome) in leather articles. New requirements apply to all products within the scope placed on the market from 1st May 2015 and include footwear and clothing made from leather. Shoemaking is a global industry that has developed over centuries on the back of a totally sustainable natural byproduct that is now under attack through deliberate misinformation. If the leather industry is damaged, so is the footwear industry; we are inseparable. The true story is therefore surely one we should all be telling. Experiential factories are places where consumers are exposed to the intricacies of the manufacturing process of the shoes they buy and so can appreciate the true values that underline them. Obviously, this scenario necessitates a profound transformation of the manufacturing, distribution and retail model and calls for a new role and a new place for the consumer. In recent years, a combination of media and consumer concern has led to increasing pressures on tanners to review certain of their processing operations. Managing director of footwear machinery and robotic systems provider Desma, Klaus Freese, spoke at the 2016 UITIC Congress on the subject of shoes produced by ‘smart’ robots. UITIC’s conferences are recognised as being of great benefit to the industry and feature serious and thought provoking papers for further discussion and development. As only a limited number of people from the industry are able to attend and hear them at first hand, World Footwear has selected two, with the generous assistance of the authors, as the basis for articles in this issue. Dr Gunter Pauli, who founded the Zero Emissions Research and Initiatives, concerned about the high unemployment he feels globalisation has caused, his main aim is to find ingenious entrepreneurial ideas that use, in the most sustainable way possible, resources we already have around us, put these ideas into practice, add value and create millions of jobs. A really concerted push for suede footwear during 2016 would not only bring a major new look to fashion footwear but also help solve a major problem for the leather industry and all at a good price point. 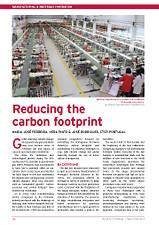 This article is based on a paper prepared for the 19th UITIC Congress by SATRA’sJohn Hubbard which outlines some benefits in terms of sustainability that can begained in footwear manufacturing by the adoption of some of its specialisedmanagement systems. Although it is still early days as far as full commercialisation is concerned, Nanofoot has clearly established the potential of using NPs in footwear manufacture and it will be interesting to see what the future will bring. Automation and robotics technology provider Actis RB System has adapted its approach to the footwear production market in Asia. It is now sure that the right mix of a traditional workforce with some carefully chosen and correctly integrated automation will offer shoe producers in most markets significant efficiencies and an acceptable return on investment. While Desma is principally known for its advanced injection moulding machines for polyurethane soling systems, it has also been a leading pioneer in the use of automation within the footwear industry using robotic arms from ABB in Sweden. The difference between purchased shoe size and shoe size predicted by foot length raises some interesting questions, particularly regarding the balance between length fit and joint width fit and the effect joint girth has on comfort. The SATRA foot sizing survey has provided data that is also being used to identify such relationships. Starting out 20 years ago, ESM’s early customers were top quality welted manufacturers in the UK, including Crockett & Jones, Church & Co. and Alfred Sargent. It now supplies welted footwear manufacturers all over the world. Are trends in foot health creating new markets? The rising numbers of people with diabetes and an ageing population will have implications for shoe design. French consulting, research and testing organisation CTC has been working with the French Footwear Federation on ADOCS, a programme of projects to improve the suitability of footwear on offer to older consumers. One of the studies so far concerns heel height and makes specific recommendations on the heel-heights that women can continue to wear safely and comfortably in their senior years. SATRA’s Steve Rose explains the reasons behind insock choices and options for manufacturers. The foot’s anatomy and the way it moves and changes are important considerations for shoemakers, and correct lasts are the basis for comfort. The July/August 2014 issue of World Footwear contained details of the latest advances in 3D printing. This further article features case histories of applications supported by numerical evidence and practical data on its applicability in footwear manufacturing. The global footwear industry continues to grow as demand continues to increase with the rise in both populations and living standards. It is also becoming ever more efficient and cost conscious so the arrival of a totally integrated CAD system is welcome news as it can help manufacturers in many ways, particularly relative newcomers to the industry. Why don’t soling materials die? For many thousands of year’s leather remained the main soling material for all types of footwear with, in certain places, wood, reeds, papyrus, sisal and other natural products also being used. This situation continued until the development of reliable rubber soles in the 1930s. What is the future of soling? Servitisation is often viewed as the way in which firms provide an integrated package of both goods and services or add extra service components to their core offering. A differing interpretation, however, suggests that it is any strategy that changes the way product functionality is delivered. A still broader definition, is that servitisation is the innovation of an organisation's capabilities and processes to better create mutual value through a shift from selling products to selling product service systems. At a conference in Bordeaux earlier this year, up to a billion extra square-feet of finished leather may be required to satisfy the increasing demand for leather upholstery in motor vehicles and a major reason lies in the extra profit margin car manufacturers can make when an additional €200 or €300 manufacturing cost can yield around €2,000 extra on the selling price. There is also no shortage of customers from around the world prepared to pay whatever it takes to own a pair of Sorrell boots, as in the case of the client who flew in from Australia to be measured for a pair of boots—in kangaroo and alligator. Current footwear styles use fasteners in two ways: firstly as a means of securing the shoe and, secondly, as fashionable design features. As a means of holding the shoe on the foot, the fastener should be considered a safety-critical component as the loss of a shoe could cause an accident and subsequent injury to the wearer. The radical changes in fortune for the world’s footwear industry since the coming of globalisation has led to much disquiet as to what the future might hold. Would Asian countries led by China develop a stranglehold on the industry? In a world seemingly obsessed by major brands, would consumer choice become increasingly restricted? And, squeezed between the forces of low wage cost manufacturing and the influence of these brands, how could small manufacturers hope to survive? Cluster networking refers to a way of coordinating or, better still, synergistically integrating the activities of different players involved in a value chain. Technology poles, more accurately, Competitiveness and Technology Poles (CTP), are determined by the needs expressed by the stakeholders in a local cluster, with the support of associations, public authorities and institutions that will be needed to bring real added value to users. The footwear industry, is merely part of a chain stretching from basic raw material to final user. The leather it widely uses as an upper material starts out with the farmer and runs through the meat packer and the tanner before finally reaching the shoe maker. Anything affecting the farmer who grows the initial animal, the abattoir that slaughters it for meat and the tanner who converts the hide from a by-product to a usable commodity therefore also affects the shoe maker and, ultimately, the consumer. Aly Khalifa is the founder of Designbox, a product and graphic design company based in Raleigh N.C. that is dedicated to ‘design innovation and inventive culture’. Having designed shoes for a variety of clients, he has some original views on how the footwear industry needs to move away from what he sees as its current default position of manufacturing using generic designs, toxic adhesives and factory labour. The world’s first footwear recycling system was developed by a team of researchers lead by Professor Shahin Rahimifard at the Centre for Sustainable Manufacturing and Recycling Technologies (SMART), at Loughborough University in the UK. While the system has proved thoroughly practical in terms of technology, it needs to operate on a large scale basis in order to become commercially viable. Nanotechnology involves the study and application of extremely small things and can be applied across all the other science fields, such as chemistry, biology, physics, materials science and engineering. It is hard to imagine just how small these particles are as one nanometre is one billionth of a metre. For instance, there are 25,400,000 nanometres in an inch and a sheet of newspaper is about 100,000 nanometres thick. The conversion of raw skins into leather, among the earliest of crafts, has now evolved into a sophisticated and technically developed industry. For just about as long as recorded history, leather has been the staple material for footwear production, whether it was the shoes Ötzi was wearing while running away from his murderers in the Swiss Alps some 5,000 years ago or King David wearing his simple sandals in Biblical times. The world of footwear manu­facturing never stands still, with shoe makers and sourcing companies always looking to improve competitiveness and gain market share. As result, testing continues to play an important role in footwear supply chains throughout the world. The footwear industry is an interesting environment as it is a great market for the introduction and testing of new ideas, products and manufacturing processes. This is because all footwear presents very demanding structural requirements due to the high stress levels experienced in the everyday wear of shoes. They may look innocuous and low-tech but are in fact high performance products. 3D printing is opening up new possibilities for shoe design and manufacture. It is also a process where advances are being made at a rapid rate as more experience is gained and an ever wider range of materials are explored so that new applications will be constantly developed. With the global economy gradually recovering over the past two years, it is an appropriate time to consider the implications for the footwear industry in terms of where it finds itself entering 2015, compared to the situation before the recession and how it may develop over the next few years. Cutting and its related technologies are among the topics that are most often cited as a demonstration of how shoe making has evolved since the dawn of the first industrial revolution; swing beam and travelling head presses were in time replaced initially by NC (numerical controls), die cutting machines and, more recently, by an all new breed of dieless cutting systems. The increasing number of people over 50 years of age in western countries is the result of a falling birth rate and the fact that people are living longer. It is estimated that by 2050 no less than one in three will be over 60. This steady increase in the number of senior citizens offers the potential of a new market for footwear, one which a group of French manufacturers has already recognised. The problem however is just what the ideal criteria are for suitable products. In a survey, 62% of people were unaware that shoes were available in different width fittings. More and more shoes are being made using synthetic upper materials, particularly PU-coated fabrics (PUCFs) where China is by far the largest producer. While PUCF uppers might not be as comfortable to wear as those made from leather, they are not harmful to the wearer. They are, however, considered to be so to people employed in the manufacture of the material itself and to the environment in general. Why is this? When designing footwear, a wealth of technical considerations have to be considered including grip, abrasion resistance, shock absorption, cushioning and ankle joint support, etc. In traditional shoe designs many visual and technical functions are performed by individual components such as for example a mid-sole made from blown polyurethane that combines low density with high shock absorption. Solid and securely attached heels are of vital importance on ladies dress shoes and, the higher the heel, the more difficult this becomes due to the small size of both the top-piece and the seat of the heel. The former creates balance problems for the wearer, while the latter makes the heel more difficult to attach securely. Although there have not been any major developments in footwear soling systems announced recently (there are several ongoing but not yet ready for publication), this does not mean there have been no advances in specific areas. As far as polyurethane soling is concerned, the key aspect has always been the accurate mixing of polyol and isocyanate to produce the chemical reaction that creates the finished sole. Rubber is regarded as being of superior quality to any other non-leather soling. While this is not always strictly true, it is nevertheless a good cachet to have and one that also means it can command a higher price point at retail. Rubber can look forward to a bright future as, even after all these years, it still has so much to offer. We are all living longer and while this is a welcome development it has, like all things, come at a price, part of which is steadily increasing cost pressures on our healthcare systems caused by an ageing population coupled with a falling number of people paying contributions. One facet of this is a growing need for medical aids such as bandages, ortheses, shoe inlays, footbeds and custom-made orthopaedic footwear. There has been much debate in recent years over chrome versus vegetable tanning and the risk of chrome VI (hexavalent chromium) being present in footwear. Several new tannages have appeared, the producers of which claim have all the benefits of the chrome process without the potential risk of chrome VI. While these new systems may well solve the problem, it will take some time for chrome to disappear so, until it does, the fundamental choice between it and vegetable tannage is likely to remain. Managing restricted sub­stances policies and getting the best out of testing budgets is becoming an increasingly important factor for footwear retailers, manufacturers and material suppliers as the range of chemical restrictions increases. The volume of hides and skins coming as a by-product from the global meat industry is truly enormous. Figures suggest the meat industry generates no fewer than 240 million cattle hides a year, together with 540 million sheepskins and 425 million goatskins. The leather industry buys up this by-product, which would otherwise mostly go to waste, and transforms it into one of the most versatile and attractive materials on earth, a material that is also the mainstay of the world's footwear industry. 3D printing has become an increasingly widespread and fashionable topic of discussion as more and more people begin to appreciate its potential. Having said that, few know much about the remarkable technology involved. The fact that it perfectly matches the concept of digital manufacturing, an approach that looks at digital technologies from the very first step of product development with 3D CAD systems to the direct manufacturing of the object, executed by machines that can understand digital data and then transform it into physical artefacts, can seem rather like magic to the uninformed. Global warming, climate change and greenhouse gas emissions have now become terms of everyday life and topics of concern and discussion worldwide. It is a widely held view that material recycling is often the best means of dealing with discarded shoes that are potentially unsuitable for reuse. However, for the long-term sustainability of such an approach, an economically viable material recycling system is essential. Mass customisation is a business model that 'inherently' leads to sustainability, provided that some basic implementation choices are made correctly, there is a general perception that going for mass customisation can positively affect some environmental key performance indicators although the amount and enablers of such effects are still controversial and, finally, that it is certainly a topic that deserves further attention and research. At the 16th UITIC Conference at Elche in 2008, a report on the status of a research project concerning virtual shoe design being carried out by the Test and Research Institute Pirmasens (PFI) in conjunction with the Technical University at Chemnitz, Germany. This virtual reality system was being developed for footwear designers in order to provide them with the artistic licence to work as intuitively and creatively as always. Current facilities in retail shops for children's footwear using cashiers with computers and operational memory would make it possible to introduce a simple system providing important information that could contribute to reducing the occurrence of deformities in children's feet. The 18th International Tech­nical Footwear Congress of UITIC (International Union of Shoe Industry Technicians) was held in Guangzhau, China in November 2013 and it attracted a large number of participants from across the world; in this instance, more than 300 from 30 countries. Health and safety should not be seen as an additional requirement for factories but as a demonstration of the commitment to a lean and efficient working environment. More than 75% of the world’s footwear production is now in Asia, a large proportion of which is exported for distribution in North America and Europe. All of today’s manufacturers regardless of location are however faced with rising material and labour costs and a shortage of skilled personnel. So how can production become more effective and efficient in order to minimise the impact of time and cost? Lighter and finer than convent­ional extruded films, non-woven membranes, made using a manufacturing tech­nique called electrospinning, may be the next big thing in water resistant clothing and footwear. Where is PU as a soling material? Polyurethane has now been available as a soling material for over 40 years, having first been introduced in the early 1970s. This was in fact a decade when three important new soling materials first appeared on the market; polyurethane (PU), thermoplastic rubber (TPR) and thermoplastic rubber (TPU). So how have these performed over the intervening years? Which are the winners, which the losers and why? Leather remains the upper material of choice for the vast majority of shoes produced in the world today. But, with all the pressures resulting from concerns over climate change, long term availability, tanning methods and environmental concerns, just how sustainable is the supply chain of the footwear industry’s favourite material and what might affect it in the future? At the end of the day, the most appropriate series of standards for a manufacturer to test against and be in accordance with will depend on where in the world the footwear is intended to be sold. The range of requirements it needs to meet will depend on the claims being made about it. The development of polyurethane-based breathable membrane technology some thirty years ago changed the invention of vulcanised rubber, as it combined resistance to water from the outside and also allowed moisture vapour to escape from the inside. Klöckner Desma, ever an innovator, has now taken a further step in its automated soling ‘concept’ by developing a robotic upper processing cell to run alongside its existing sole processing cell and so provide footwear manufacturers with the ultimate in automated soling solutions. Consumers are faced with three dilemmas. The first is choice, then the second is size. This brings us to the third; comfort. The answer to this lies in foot scanners and last/shoe/foot matching algorithms. Bonded leather is both strong and supple, so the counter will give enough support in the right places while also adapting to the shape of the foot. The United States of America can truly be said to have been the main driving force behind the mechanisation of the footwear business. With a large domestic population it also quickly developed a substantial footwear industry to supply it. This in turn spawned a supply chain to feed the factories with all the materials, machinery and components that it required. Water has become an increasingly precious resource in many parts of the world. As a result, large industrial users have come under intense pressure to either change their technologies so as to use less or, if that is not practicable, to recycle as much as possible. Despite the brickbats thrown at the leather industry over the years in regard to its environmental conduct, it is in fact right at the forefront of water recycling. Producing lasts on which to make shoes that can encompass such variations as this is demanding in the extreme. It is no wonder that last making has always been one of the most skilled aspects of footwear manufacture and, despite the sophistication of the technology now used, is likely to remain so into the foreseeable future. Adhesives are used in a wide number of applications in the manufacture of footwear. The major ones, together with the most important types of adhesive used in each case, are shown in Figure 1. The two key areas in terms of volume of adhesive used are lasting and sole attaching, so this article will focus very much on these with especial attention given to the latter. The past 40 years has seen a dramatic shift in footwear manufacture from West to East mainly in a quest to reduce costs. It has also seen the development of a range of soling materials made from petroleum-based polymers which have helped to make this phenomenal growth in footwear manufacture possible. We have come a long way from the old shoemaker sitting at his bench and lasting each shoe by hand. One wonders what he would think of today’s state-of-the-art lasting machines where science has largely replaced skill but still produces a top quality result at a speed he could never have envisaged. In a vision of a possible future, shoe manufacturers in fact become ‘design creators’ and consumers the ‘makers’ of the products they buy and consume, quite a genetic mutation in their respective roles and a complete rearrangement of the value chain. As so many examples have already shown us, the digital invasion is unstoppable, so it might be as well for 21st century shoe producers to be prepared for such a disruptive ‘singularity point’. A good personal working relationship between supplier and customer is essential in producing a bespoke product. Clients who expect all the input to come from the other side not only make life more difficult for all concerned but are inevitably the hardest to satisfy. While there are always a few like this, the vast majority fortunately fall into the former category and so gain the most from their investment. There are a number of initiatives within the footwear industry which lead towards the greater utilisation of sustainable materials and to footwear with eco-design features. However, until this becomes the normal behaviour of the main retailers and brands, it will remain a niche market appealing to a specific demographic customer base. If factories can become leaner, their processes greener and the shoes they produce generally cleaner, the footwear industry will undoubtedly take an impressive step forward. It will make important returns not only in terms of better efficiency and higher margins for the companies involved but, also, gain a competitive advantage among a new generation of consumers more interested in and responsive to these arguments. Finally, our world will also be a better place to live in and that is surely a target worth supporting and fighting for. Despite affirmation of its viability as a production procedure, maturity of its design and dramatic technological advances, dieless cutting although now out of its infancy is still in its first youth and more growth is to be expected in the future. Leather is infinitely variable depending on the type of hide, fibre structure, tannage and grain surface. It is therefore essential to fully understand any leather before using it in order to avoid any problems in either manufacture or in wear. Needless to say, there is a large number of tests that can be applied, some appropriate for many end uses and some more limited. There can also be more than one test method to determine the same basic property. It is therefore important to know which ones to use. Paper patterns or written rules for calculating sizes and patterns did not exist as they could be stolen and used by anyone wishing to set up as a rival. Today, we only need to buy a software package and all these problems are answered by a machine. At one time the choice of upper materials available to shoemakers was limited to leather and natural woven fibres such as cotton. That choice is now extremely wide and includes many specialised materials reflecting the diversity of shoemaking itself. Some of these materials are quite unique in the ways in which they provide practical solutions to problems of foot comfort, safety and wellbeing. Having created these successful materials, their producers nevertheless continue to refine and improve them to meet the ever greater expectations of shoemakers and their customers alike. Vibram has enjoyed an outstanding reputation for high performance rubber soles in demanding applications ever since its first, and probably most famous, product—the Carrarmato climbing boot—sole was created in 1937. Automation has become a keyword in the equation of containing costs while still pursuing the highest possible quality. PU direct injection has the potential to eliminate more than 50% of adhesives used in the cemented process while at the same time offering high performance bonding between the various layers of the sole and better compression-set properties compared with EVA. For thousands of years leather was produced using plant extracts and other natural materials. Over time, some were shown to produce better results than others. The bark from certain types of tree, particularly the oak, seemed best and bark tanning became the norm for almost all leather up until the discovery of chrome tannage in the late 19th century. It is now very restricted where footwear is concerned but still used to produce the very best quality leather soles. Natural rubber has been known for hundreds of years. In its natural form, it was not suitable for use in footwear as it was too elastic, became sticky in hot conditions and hard and brittle in the cold. It was not until the 19th century that it became possible to modify it sufficiently for footwear use. The most significant advance, came with the addition of sulphur and subsequent heating of the mixture, a process called vulcanisation, which made it more stable. CSR is not just about offering good working conditions for employees, but a fundamental approach to business that encompasses a totally responsible approach in every facet of management such that the enterprise operates to the benefit of society and the environment as a whole, as well as its customers and shareholders. This is a complex task for any organisation and, needless to say, the larger it is and the more global its operations, the more complex it becomes. Improvement in living standards relies mainly on economic development. It has gathered pace such that for the vast majority of people it bears little comparison with that of even a hundred years ago. Inevitably, however, some remain less prosperous than others. Our focus in this issue on sustainability makes it imperative for us to consider recent comments from one of the world’s most prominent athletic footwear brands, Puma, on the environmental impact of its shoes. The main article we offer is the result of our analysis of comments the brand made earlier in 2012. However, a new announcement from the company at the start of October means that the article requires a more up-to-date context, which we attempt to give here. While the ongoing pursuit of sustainability and support for the environment is laudable and must continue, it must nevertheless be treated in a pragmatic and balanced manner. While PVCs long-term future—like that of anything else in life—cannot be guaranteed, there is still some way to go before this ubiquitous soling material can be written off. The extra­ordinary versatility of poly­urethane appears to have no limits and the material will doubtless find further applications in footwear manufacture in the future. While the welted process now occupies only a very small and exclusive niche in the footwear market it was, nevertheless, its introduction in the early 16th century that created the ‘big bang’ which in turn led to the footwear industry we know today. The fact that machinery manufacturers have been able to combine the strengths of electronic NC control with sophisticated engineering may well have sounded the death knell for the traditional labour force everywhere and, with it, the inherent advantages of low cost economies. On a more level automated global playing field, could the industry be about to turn full circle and Western countries bring footwear manufacture back home? In the future, robotics may therefore see a higher density of machines of a new generation, re-establishing the balance between labour and capital intensity in a way that will possibly induce companies to revise their outsourcing polices in favour of market proximity and local manufacturing. In such a futuristic scenario, we cannot but share The Economist’s view that we are at the dawn of a new industrial revolution. There has been change, not in the way things are done but in the threads that are now available. Once, it was a simple choice between nylon and polyester. Now, new generations of synthetic fibres have enabled thread manufacturers to create a step change in the way stitching threads perform. “The most reliable way to forecast the future is to try to understand the present,” so claimed John Naisbitt, a US writer known for his visions of the future: it is what we will endeavour to do in this article. His book titled ‘High Tech, High Touch’ captured in four words footwear manufacturing today and how it might become. He affirms that to be high touch more than simply high tech, technology must preserve our humanity rather than intrude upon it: technology is the creative product of our imagination. The changes in footwear manufacture have been matched by the changes that have occurred in the production of leather. Some of the developments are similar to both industries but others have been driven by far-reaching environmental legislation and stricter controls to safeguard the end consumer. The dominance of global brands and the demands they have made on their supply chain are all intertwined in the footwear story of the past 25 years. Richard Daniels, World Leather’s Technical Editor, considers the leather sector and how it has achieved greater uniformity and consistency. It is only to be expected that new levels of expertise and practical skills will in turn generate an appetite for progress and promotion. Failure to recognise this will merely result in spending money on training for another employer’s benefit. If the aim is to have better employees, their newly acquired skills and knowledge must be put to good use. If not, they are quite likely to leave and join a more progressive competitor. It has been said that in today’s market it is highly unlikely that anyone could make the same impact now with a footwear component as the long-established brands we look at here. While that is probably broadly true, there will always be exceptions—the ion-mask system may be one but only time will tell. Whichever way you look at it,manufacturers still rely on what is essentially 20th century technology in the form of a roughing brush or tool. Laser roughing, on the other hand, is a total break with the past and a truly 21st century technology that opens up all manner of new possibilities. And, unlike the simple machine of 60 years ago, it can achieve all this without the need for a high degree of human skill, concentration and stamina. Contourex 3D footbeds can even be shaped on either side to match both the underside of the foot and the inside of the shoe, including individual lettering, logos and profiles if required. In a mass market world, Brötje has gone the other way and is probably one of the most specialist foam insert suppliers in the world. At the same time, it has used automation to enable it to produce its inserts quickly, at high volume and to the highest quality level—surely the best of both worlds. OrthoLite, with headquarters in the U.S.A., is a major volume producer of moulded foam inserts for footwear. Its particular forte is its ability to quickly create products individually tailored to its customers’ requirements and then deliver them efficiently to their factories from its manufacturing facilities in Asia and the Far East. Among the most overlooked components of a shoe are the toe puff and counter yet, in most instances, they are essential for preserving its shape, providing protection to the wearer’s toes and support around their heels. They, or more particularly the materials they are made from, are however seldom considered important in terms of innovation as are upper leathers or soling materials. The European Union’s strict environmental controls, high labour costs and increasingly restrictive employment laws have prompted many manufacturing companies in the footwear sector to shift their production to Asia. While this has been seen as a quick and easy fix, it has also led to a totally different set of problems involving lengthy supply chains, controlling quality at a distance and, of late, increasing costs due to rapidly rising labour rates in much of the Far East. Are we missing out on something? The use of Celliant technology in sports apparel has grown of late and is now beginning a move into sports shoes in the form of linings and insoles. Some positive test results from various independent medical bodies over the last two or three years would appear to have begun to break the log jam. Some people, still have a problem understanding how the technology works as it appears, on the face of it, to be more magic than logic and it’s always hard to accept something you do not understand. The fragility of the earth we live upon and the damage that has been inflicted on it by over exploitation by industry and farming during the last century can be staggering. While there remain some pockets of denial regarding global warming and climate change, the overwhelming majority are concerned, if not for themselves, for their children and grandchildren. Indeed, ‘going green’ has become a lifestyle fashion and wherever fashion goes, manufacturers are quick to follow. Much has been made of western companies setting the pace for using recycled materials and environmentally friendly methods of manufacture. This is of course not entirely true. Anyone who has spent any time in India, for example, will have witnessed at first hand the ingenious ways in which everything possible is recycled. In fact, we all used to recycle until some of us in the west became too affluent to bother. The first man-made plastic was invented in Britain by Alexander Parkes in 1861. Called Parkesine, it was a cellulose derivative that could be heated, moulded and, when cool, would retain that shape. It was not however commercially practicable. In 1868, John Wesley Hyatt in America developed Celluloid which was; with the help of his brother he then went on to patent the first injection moulding machine in 1872. For the next 70 years, the process changed very little and its use was restricted to manufacturing simple products such as buttons and hair combs. German machine manufacturer Desma has always been a major innovator, particularly in the field of PU and TPU moulding machines. While the basic technologies of injection moulding as a process are long established, refinements continue to be made to increase the capability, output and flexibility of these complex machines. Slippery floors, occur everywhere in the world and are an everyday hazard for people working in hotels, kitchens, restaurants and laundries. They can take the form of wet or greasy floors, brightly polished stairs and entrances, or other routes with slippery surfaces used by waiters, room service staff, cooks and other members of staff. Footwear manufacturers are trying to address this. The idea of designing footwear with comfort as the primary aim really started with the sports shoe phenomenon of the latter part of the last century. Wearers found the shock absorbing qualities of these shoes offered a new walking experience and began to demand the same in their every day footwear. The volume and value of Italian exports of shoes made from synthetic material are on the rise. However, ANCI says Made in Italy will always be more associated with leather than with any other material currently in use for footwear manufacture. The first contacts of the shoe industry with the digital domain date back many years to when personal computers and graphic workstations first appeared. Since then, the drift from the old analogue world reliant on human control, physical tools and manual operations, has steadily increased the progressive digitalisation of systems, machines and processes up to the level we know today. In numerous shoe surveys conducted over the years, comfort has always topped the list of desirable features for consumers. Comfort, however, is an extremely complex concept to attain. he Harman Group with its headquarters in India’s economic and financial capital Mumbai is a major player in the supply side of India’s footwear and leathergoods industry. India's footwear industry has made enormous strides in recent years. Some say that it could rival China as a major driving force in the global footwear market. In the March/April issue of World Footwear, an article on Prize Boots looked at the high degree of skill possessed by English shoemakers in the first half of the 19th century. The second half of that century witnessed the invention of machines that turned a handcraft industry into a highly mechanised one. he global market for safety footwear is immense and,as many developing countries become more industrialised, it continues to grow. With the global expansion of footwear manufacture, not all countries demanded the same standards in regard to safety footwear sold within their boundaries. Brazilian footwear machinery manufacturer Sazi has launched a new version of its Intelligent line of machines, offering savings in energy consumption that it believes can quickly make an impact on a footwear manufacturer’s bottom line. Cindy Strangl, general manager of Faytex,the producer of DriLex moisture management shoe linings, started to wait a new fibre from DuPont. It is called Triexta and it represents a new generic fibre subclass in the PTT category. A new revolution in tanning? In recent years, we have noticed a trend among some shoe manufacturers, who put their faith in veg-tanned leathers, to claim a green marketing tag for their product. That there are various methods of tanning is not disputed but to claim the moral high ground for veg-tanning is not necessarily accurate. Sixty years ago, the word 'finishing' referred to the sequence of operations that followed sole attaching in the traditional shoemaking process. Now, the traditional 'finishing department' only exists in factories producing expensive specialised types of footwear. Research centres, technology providers and two footwear manufacturers are working together to find ways of using robotics to make high-end fashion footwear in the most efficient and competitive way possible. John Hubbard of the SATRA Technology Centre reviews the formation of hexavalent chromium in leather as it is currently understood. A child's foot adapts to the developing skeleton and its constant postural changes. The natural development of young feet is greatly influenced by the footwear that is worn throughout childhood and, in particular, the period when a child is learning to walk. It is therefore vital that the correct footwear is worn at each stage of development. Is mass customisation of footwear realistic? Shoe making is a fairly traditional business. There have only been a few truly radical changes in terms of manufacturing approach or organisation and business models. The concept of mass customisation is one of them and a most exciting one. Without grading the upper shoe patterns to achieve all the different sizes, shoemaking as we know it would not be possible. An obvious synergy existed between the Delcam and CRISPIN so, in 2007, Delcam acquired the CRISPIN business to create Delcam CRISPIN with the aim of providing a range of products that would offer software programs covering all aspects of the design and tooling process for footwear. A young entrepreneur based in Michigan, US, recently launched ‘upcycled’ footwear made from old billboards as an alternative to going barefoot. Desma has used a combination of robotics and advanced materials to create new production concepts. Low labour costs or full automation? Conventional footwear production is labour intensive. It must be carried out billions of times in a reproducible manner if the global demand for footwear is to be met. It also clearly calls for a large amount of skilled labour so manufacturers tend to specialise in specific types. Laces have traditionally been regarded as an incidental item but they are now frequently a key feature of the overall shoe concept, even to the point of carrying the brand logo. The Bata Shoe Museum in Toronto has just concluded an exhibition that looked in the closest possible detail at the development of the high-heel shoe from its origins in the chopines that became all the rage among affluent women in Renaissance Italy and Spain to the moment when it became a footwear choice for women only. The problems peculiar to the footwear industry, coupled with the high capital investment involved, has meant that, with the exception of direct injection soling, the use of robots is a rarity. Sergio Dulio discusses why this is. Two iconic footwear brands with a penchant for leisure in and around water have come up with new ideas to keep product innovation flowing. In a previous article, we reported on the presentation made by the vice-president of product development and product application for specialty chemicals provider Lanxess at this year’s Beast to Beauty conference. Tanners have become increasingly frustrated in the way that the use of chrome has been presented to the public in general. It is high time that its continued usage or replacement by vegetable tanning agents was examined in a less hysterical and alarmist manner. Of all the methods that are now available for attaching soles to lasted uppers, the oldest by far is using thread to produce a mechanical join. Thread is still essential for sole attachment in several key footwear constructions, so it is useful to understand the basics that lie behind this most traditional aspect of the shoemaker’s art. Injection moulding has been described as a process by which a polymer is softened by heat before being injected into a mould, from which it is ejected once it has set to the shape of that mould. A huge proportion of today’s footwear features injection-moulded components as part of their construction. They are made from a wide range of polymers and can be found as part of––if not the whole––upper, insole and sole. Far and away the most important application is of course for soling in the form of pre-moulded units or moulded direct onto the lasted upper. The recently released updated version of Delcam CRISPIN’s LastMaker software has opened up further possibilities for footwear manufacturers wishing develop or modify lasts in-house, so it is perhaps a good time to take a look at what the program has to offer. The first adhesives to successfully bond a sole to the upper entirely on their own appeared in the 1940s and were based on nitrile or polychloroprene rubbers dissolved in solvents. The rise of hook-and-loop fastenings in footwear applications. A key factor in the efficient cutting of leather is to ensure it is up to the agreed specification. Tanners and shoemakers are increasingly working together to achieve this as they perceive it to be in their mutual interest. Taiwanese-owned tannery Teh Chang and footwear manufacturer Genfort are a good example and use the SATRA five-point leather grading system to ensure consistent quality. An adhesive is a substance used to bond two opposing surfaces together and to then resist them from being separated. The ability to do this is determined by its strength, the nature of the two surfaces involved and the manner by which it is applied. Adhesives are all solutions at some stage and the solvents used to produce them have a direct bearing on the speed and manner in which they set. Choosing the right adhesive is therefore important. India is the world's second largest producer of footwear after China and is still growing. Its domestic footwear market in particular has expanded significantly in recent years. Growth in footwear manufacture has also accelerated due to anti-dumping measures against China and Vietnam by the European Union and a global shift in manufacturing to lower cost producers. Fashion trends come and go; colours, shapes and cuts change with the seasons. It is therefore good that some old favourites such as nubuck and suede leathers never change. They are extremely soft and have a velvety feel which many consumers prize above all others. Unfortunately, there is also a downside—as many footwear manufacturers and retailers know to their cost. Swiss company On has come up with a footwear technology that absorbs both vertical and horizontal forces on the foot while running. On was the overall winner of this year’s ispo BrandNew Awards presented by Advansa ThermoºCool. The award was presented at the most recent edition of the sporting goods in Munich in early February. A start-up company in the US has devised a new footwear product made from a very old material. Stuffits, no matter whether the climate is wet or dry, hot or cold, and no matter the environment or outdoor terrain, sports and outdoor shoes are bound to contain or retain moisture, leading to bacterial build-up and the possibility of bad smells. Footwear Fundamentals - Quality or Yield? Cutting the components of a leather shoe upper demands a wide range of skills, not the least of which is balancing quality with yield. It could equally be referred to as balancing quality with cost and, as such, is an age old debate that continues to this day. Upper materials form a significant proportion of the cost of a finished shoe, so minimising cutting waste is critical to remaining competitive. Listed here are eleven key factors that need to be properly controlled to ensure a high standard of materials management. Footwear can be both lined and unlined depending on the style and purpose. Unlined moccasins and sandals, in particular, are comfortable to wear simply because they are so lightweight. On the other hand, climbing shoes need to be a perfect and tight fit, and producing them without linings makes this possible. In his address to the 2009 CPI Conference, leading soling material consultant Steve Lee of Steve Lee Associates remarked that polyurethane has failed to increase its market share beyond the six percent it has held for the past few years. Clearly, the global economic downturn has hit footwear product overall but, considering all the plusses that polyurethane has as a soling material, this still comes as something of a surprise. The word ‘last’ comes from the Old English word ‘laest’, meaning a footprint or foot shape and from the Old Norse word ‘leistr’, meaning a foot. A last is a three dimensional shape, which reflects the shape of the foot plus any fashion features that have been added by the last modeller and shoe designer. The process of lasting converts a two dimensional upper material into the permanent three dimensional shape of the last and prepares it for the attachment of the sole by whichever construction has been decided upon. How lasts convert two-dimensional materials into a three-dimensional shoe shape. A wider range of colours for unlined shoes is available thanks to technology developments in the footwear industry. Bio-based colour dispersions are now available to offer a number of advantages to footwear manufacturers. We still sew shoe upper sections together? For three good reasons. With most traditional shoemaking materials it is still the best and most flexible way to join them, lasting is easier, and stitching can be used for decoration. Since its inception in the 19th century, the chemical industry has been using ‘old’ carbon taken from fossil resources, especially oil. It has used it to produce products such as polymers which, after use, are either converted into CO2 by burning or remain unchanged for centuries in landfill sites. Biomechanical studies carried out at the German Sport University in Cologne into the use of cushioning in sports shoes have revealed surprising results. Dimethyl fumarate is the methyl ester of fumaric acid and can be used to treat certain medical conditions. While not quite in the same category as ‘hazardous’ substances such as chrome VI, it nevertheless remains one of the most potent sensitisers around and it is for this reason that the EU classifies it as being ‘harmful’. In part one, we looked at the historical development of footwear constructions and dealt specifically with the welted, veldtschoen and cemented methods. These all need lasting machines as part of the process although, in the case of the veldtschoen, variants have appeared where they are no longer needed. This second part includes a number of constructions that also do not use them but are nevertheless used to produce a wide range of footwear types. 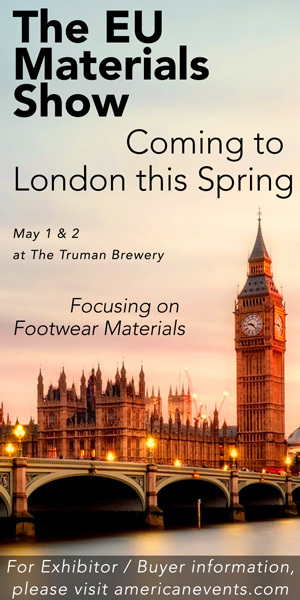 A report on the Desma House Fair 2008, at which the footwear production systems provider hosted partner companies and visitors from across the globe for an exhibition, live demonstrations, a seminar programme and social events. Part one of a two-part paper in Footwear Fundamentals series offering guidance on how to choose the best construction for the shoes you want to manufacture. The choice of materials to use for soles has never been greater. The potential benefits to footwear manufacturers of water-jet cutting, explained by Portuguese solutions provider Zipor. Ecco expands its integrated model - with footwear factory and tannery side by side - to its facility in Xiamen, China. SATRA's advanced test can help manufacturers make shoes more comfortable. Goodyear welted construction's new lease of life. Still number one: why there is still nothing to touch leather for shoe uppers. What constitutes a waterproof shoe? P2i's ion-mask technology really does seem to offer significant improvements over previous methods for making shoes water resistant. How our forebears went about making footwear with the limited technology available to them in the Middle Ages. Brazlian components manufacturer Artecola tackles time and materials wastage in the footwear industry. Technology provider Lectra launches a new version of its Romans software in an attempt to help the industry meet the demands of a growing world population. Shoe upper patterns have always been something of a mystery to most people in the industry at large and a bone of contention in the factories themselves. A round-up of some of the IT tools currently in use for designing and constructing a last. Apparently, it’s easy to come up with a good idea. You might expect Spencer White to take another view because, during his time as director of advanced technology at athletic sports brand Reebok, concepts of his—the Pump (the first shoe to have an internal inflation mechanism to make the upper fit better) and the DNX (shoes containing cushions of moving air)—won worldwide renown and featured in the company’s global advertising campaigns, but he says there are millions of good ideas around. Everyone dreams of having a ‘eureka’ moment at some point, experiencing a life-changing flash of brilliant thinking. This often happens in the bath, where water helps people relax, encouraging creative thinking. Natural rubber has played a key roll in the development of the footwear industry and is still used in a wide variety of products. Millions of children grew up in the twentieth century wearing sandals with hard wearing natural crêpe rubber soles. Millions of soldiers, farmers and industrial workers have used waterproof Wellington boots since they were invented by Henry Norris in 1856. The iconic Converse sneaker had a natural rubber sole. And, where would the Australian brand R.M. Williams be without elastic for its famous stockman’s boots? While most of us are familiar with the industry’s use of natural rubber, we are probably not quite so familiar with its background. There was a time when producing a shoe was simply a case of choosing from a limited number of traditional upper designs, deciding on the upper leather to be used, cutting patterns to suit leather, last and construction and then, starting production. Indeed, to save time and money, an existing set of patterns would often be used on more than one last with perhaps a half-size larger vamp enough to accommodate a slightly different toe shape. Although shoemaking was more complex in the number and diversity of the operations involved, it did allow more flexibility than the fine tolerances demanded by modern constructions using direct injection or pre-moulded unit soles. Vietnam: will the new Sourcing Centre Happen? The authorities in the southern province of Binh Duong insist a massive new all-under-one-roof sourcing centre for the footwear industry will open its doors to shoe manufacturers this year, but it's all gone a bit quiet. Footwear manufacturers in India have a great chance of improving their share of the world market in the coming years, but experts believe a huge investment in technology may be necessary. The foot is a highly complex part of the body, containing 26 bones, 107 ligaments and 19 muscles that combine to allow us to move around. Understanding how this complex structure operates is essential when producing the lasts on which our shoes are made. A fascinating insight into one of the main centres of footwear production in India, the city of Agra, which still has tiny production units scattered throughout its narrow streets and whose key strength is still its highly skilled workforce. Lyon-based footwear testing institute CTC has developed a method of digitally simulating the famous Bennewart test for soiling material. How some of the major players on the Indian, Asian and world scene began as, and continue to be, tanners. Their expertise with, and ready supply of, the principal raw material going into shoes gave them the best possible start in the shoe business. Why computer-controlled lasting machines and a skilled workforce to operate them are essential in the production of most dress and fashion shoes, regardless of whether they feature stitched or cemented soles. Leather is our oldest shoemaking material. From the earliest hunter-gatherers down to the modern day, animals’ flesh has formed an important part of man’s diet and their skins a weather-resistant covering for his body. He also soon found ways to preserve these skins from decomposition and, over time, gradually discovered new substances and techniques that enhanced their strength and utility. The concept of turning hides into leather by the process of tannage had been born. Few people have ever considered walking down the street wearing plastic water bottles or car tyres on their feet and even fewer would pick either as their first choice for comfort, protection or style. However, several footwear companies are recycling these and other unusual ingredients to make high quality shoes and sandals rather than creating items from new raw materials each time. A magazine called marktXL, a consumer affairs title published by Cologne-based broadcaster Westdeutscher Rundfunk (WDR), does not mess around. One of the thorny subjects it has embraced in recent months is the level of chromium VI present in the leather in children’s shoes. This last analysis concluded that the footwear industry in Germany, Austria and beyond needs to make a marked improvement in its performance. A game of football can be won by a single moment of genius from star players. When the dead-ball specialist steps up to attempt to curl a free kick over the wall and into the top corner, you have to hope his boot and, by extension, his foot are in the best possible condition. In the rain and snow of a winter’s night, keeping feet, socks and boots warm and dry could be the difference between success and failure. That’s why, at the start of this season, footwear and apparel brand Umbro launched a new line of football boot, the Ultra SX, promising a breakthrough in exactly this area. Modern computer nesting systems are helping shoe manufacturers to achieve ever better use of their upper leather. However, the concept of a maximum yield cutting system is by no means new and the men who traditionally achieved this by hand were amongst the most skilled that the industry has ever seen. Industrial robots first appeared in the footwear industry some 20 years ago and, since then, have played an increasingly important role in reducing costs and improving quality. During this time, German machinery company Klöckner DESMA has developed many specific robotic applications. More recently, it has brought all these together to form a complete production system called amir(automated machinery and material flow technology with integrated robots). Moulded sole units have been around for a long time and are used on most fashion footwear and a good many sports and casual shoes as well. While not as cheap as direct bottoming, they offer far greater flexibility and, where a sole is offered without exclusivity, no capital investment on moulds by the shoemaker. The potential safety risks that users are exposed to in regard to many everyday items are covered by European Directives such as the Toy Safety Directive, the PPE directive or the requirements for electrical items. For a large number of others, however, there is no recognised standard which can be followed to demonstrate that the item is fit for purpose with respect to safety. Such products are covered by the European General Products Safety Directive (GPSD). A breakthrough in waterproof footwear? A small UK company believes that it may have developed something that could revolutionise the outdoor footwear sector. There have been many companies in the past who have rushed to market with what they claimed was groundbreaking technology only to fail. P2i, however, appears to be somewhat different. Rather than rush forward, it has proceeded carefully, pausing many times to make sure it was going in the right direction and that it had all the right equipment. Manufacturers in all sectors have become obliged by law to reduce their emissions of Organic Volatile Compounds (VOCs). In the footwear industry, one of the main sources of VOCs is the process of cementing soles for attachment to the lasted upper. While in many cases it is possible to use water-based adhesives, the bonding surface must still be prepared using a halogenisation process. Many shoemaking operations involve the use of adhesives of which there is wide range, including latex, polychloroprenes, polyurethanes, hot melts, pressure sensitive adhesives, cyanoacylates, solvent wipes, primers and other surface treatments. With such a bewildering number of possibilities, the use of adhesives in footwear will be broken down into three areas: sole bonding, upper lasting and ancillary bonding operations. This first article deals with sole bonding with the other two areas following in future issues. Does CAD make better pattern cutters? CAD/CAM systems have had a major impact on how pattern cutters work over the last 15-20 years with their convenience of use and transferability of data, speed and accuracy. But, does built-in expertise really enable CAD software to assist the less experienced pattern cutter? In the 1980s, the footwear industries of the major Western economies began to feel the impact of inexpensive shoe imports from Asia and other areas. The problem was not limited to shoe manufacturers. No one felt this need to increase productivity more than the extremely labour-intensive last industry. Timberland has become something of a cultural icon as well as a leading brand. Amid all this hype, it is easy to overlook the fact that the company is also something of a manufacturing innovator. It was an early pioneer of injection moulding in the 1960s in order to produce effective water resistant boots. The latest innovation by the company is taking place behind the scenes with the introduction of DSSP (digital shape sampling and processing) technology from Geomagic for greater footwear customisation, faster time to market, more consistent quality and a reduction in manufacturing waste. Heavy sweating or perspiring is a consequence of all strenuous physical activity. This is an unavoidable fact and an essential physiological reaction. Mike Wilson from UK technology centre SATRA explains how footwear has become an important factor in how efficiently temperature regulation occurs. Most people go for cement lasting for foreparts, cement and/or tacks for waists, and tacks for the seat. There is a wide choice of machinery and selection depends not only on technological suitability for the products to be lasted, but also on factors such as operator skills, climate and availability of service. The insole is the foundation for almost all types of footwear other than those with moccasin type constructions. It provides a stable platform to which the upper can be fixed during lasting, ready for the sole to be attached. An essential factor in creating comfort in footwear is that of achieving a balance between the interior volume of a shoe and the foot itself. As, until now, no precise system to measure the inner volume of a finished shoe has been available, CTC Groupe in France is developing a 3D tool to evaluate the fit of the finished product and ensure there is sufficient room between it and the foot. This will in turn optimise the shape of lasts and the footwear produced on them. An insight into how and why rubber became such an important material in footwear. In this, the second of a two-part article, World Footwear looks at the machinery needed to process natural rubber into vulcanised. Beside statements of fashion, shoes have an important protective function to fulfil. The higher the potential negative influences such as heat, cold and mechanical impact, the thicker the upper and sole generally become and, as a consequence, the stiffer the shoe. While good grip is an advantage for everyday walking, it is essential for most sporting activities. SATRA slip specialist Mike Wilson looks at the elements that must be considered to provide sufficient shoe/ground interaction to meet the most demanding performance expectations in sports footwear. Machinery & systems: SIMAC - Marking time or going under? SIMAC ran together with Tanning Tech for the first time this year, but is the show likely to survive? World Footwear looks at the prducts on offer at this year's fair. In footwear testing, it has long been an ambition to invent a 'walking machine' capable of behaving exactly like the human foot so that shoes can be tested as realistically as possible. SATRA soling specialist Mike George describes the technology centre's solution to the problem. Testing for water resistance in footwear has always presented problems and when military boots become involved the high standards required call for the most stringent testing, which can be expensive and time consuming. A new method using a centrifuge may prove to be the answer. Colour fastness of leather to rubbing. One of the most important tools in shoe production is the last and, although there are no compulsory last standards, specific control measurements are vital. In the Goodyear welted process thare are some key operations that clearly demonstrate why so much skill and attention to detail is required to produce the best results. A new solution to the problem of hydrolysis and poor resistance to ageing under humid conditions. Why is vulcanised rubber such an important soling material in the footwear industry? In this, the first of a two-part feature article World Footwear looks at its background and explains how it works. Flattening a boot vamp is associated with changing the shape of a pattern by a procedure that is not well defined but, according to experienced patter cutter Tony Garley, confidence comes from method and understanding. French footwear research organisation CTC Groupe is conducting a three-year project based on an 'Eco-Concept' in order to find ways for all manufacturers to produce better products with less environmental impact. Richard Turner, deputy chief executive of SATRA, chairs the CEN TC 161 main committee and the ISO TC94/SC3 committee which together are responsible for the new standards for safety footwear. He explains the implications of the latest legislation. Polyurethane is an increasingly vital material in footwear production. To find out more about how the applications for PU could develop, World Footwear asked Bayer MaterialScience to identify possible future trends. The physical properties of hides and skins are central to their behaviour within leather-making, the manufacture of an article, and the performance of that product in use. But these properties vary according to location across the hide and the mechanical splitting of the skin structure. Before looking at how a material is used in an industry, it is essential to establish the background in terms of production and demand. While most shoes made today are either flat-lasted or force-lasted on the Strobel principle and with either stuck on or direct-moulded soles, there is still a huge market for mocassins and other essentially stitched constructions. Colourfastness of small samples to dry cleaning solutions. Is there a future for cyanoacrylates? We are all familiar with ‘superglue’ or cyanoacrylate (CA) to give it its correct title, but what exactly is it and how does it actually work? Polyurethane was introduced as a shoe soling material in the 1970s. The main advantages are that it is tough, flexible, hardwearing and elastomeric over a wide density range. Hence PU finds applications in a number of different areas, from outsoles to inner soles, and has a 7% market share of all soling materials. Early systems were based on adipate polyesters and, although some polyether-based PU is still used, the majority (83%) of shoe soling is still ester-based. A look at the history of Desma and how it has diversified over the years. Today’s footwear market is making it increasingly difficult for manufacturers in developed countries to survive. Imports of shoes from countries such as China and Vietnam have grown rapidly and this is forcing them to look for new sales and production strategies. One approach is to concentrate on niche products that are not of interest to the lower priced mass-production factories of Asia. Small volume individual production runs, customer oriented service and an emphasis on comfortable and functional products, have led to PFI in Germany investing in the development of customised foot scanning. How much planning is worthwhile? That’s a very good question to pose. Some planning is obviously needed but it is increasingly uneconomic to use manpower to get down to fine detail when unexpected events can still cause disruption. Changing industry requirements have not generally been matched by systems development and this is a topic that is very much one of ‘horses for courses’. While enterprise resource planning, material requirements planning and management information systems are widely used the focus is not on production planning, so the modules related to this can be rather pedestrian. Numerical simulation is currently used in a variety of industries such as automotive, aeronautics and plastics, where it affords important financial and quality benefits. Its potential is not fully recognised in the footwear industry and, as a result, it is seldom used as a manufacturing tool. Jean Luc Chaverot, CTC Groupe, France, explains the potential. Colour fastness of leather to mild washing. Technology: Just how complex can sports shoes be? Soccer boots have undergone dramatic changes since the leather-soled and studded product of the 1940s and '50s and some interesting new technology has appeared recently. Frank Toseland and Sons goes back to its origins to survive in the modern world. Footwear technology: Is there enough protection in soccer shoes? Do soccer boots offer the level of protection required in the modern game? With the shift of footwear production to low labour cost countries, low cost footwear no longer only means locally produced footwear to fulfil a basic need for protection. It now covers footwear that is exported around the world. Shoe manufacturers, supported by increasingly hygiene aware consumers, are now demanding anti-microbial properties in shoes. This has led to the development of tests to investigate and verify the anti-microbial properties of the leathers used. Extracts from a paper by the Biomechanics Laboratory of IBTeC, the Brazilian Institute of Leather, Footwear and Leathergoods Technology. Introduced as an insole or lining for sports shoes DS2 Drying Sweat System has been successfully tested for use in cases of podiatry problems, such as those suffered by people with diabetes, where open wounds can occur. Whilst exotic leathers remain ever popular amongst consumers, they require spesilist tanning. If you think about your feet during the day, it means that you are in the majority... people who wear badly fitting shoes. Pattern cutting has undergone enormous changes since the introduction of CAD, but how many operators of theses systems fully understand what is going on and why? Numerous tests exist to evaluate comfort and resistance. One aspect that has not been well covered in the past is the ageing of a shoe, and in particular the sole, when subjected to repetitive stress. As a chartered physiotherapist and an accomplished marathon runner Adri Hartveld knows a great deal about running and preventing injuries and, following seven years of work, he has now produced a revolutionary heel-less running shoe. Millable polyurethane rubber(MPR)is being used more and more in industrila applications. Since it is made from a number of polyester or polyether polyols along with chain extenders and a variety of diisocyanates, its properties vary widely... some of these are ideal for athletic shoe soles. The use of robotics for wider applications seemed to have stalled in recent years, but what is the the current situation? This Grey Scale is for assessing the degree of stainig caused by a dyed leather in colour fastness tests. There are now strict EU regulations in place to protect both people and the environment from hazardous substances. This means that all footwear destined for the EU must now be tested and this can be more complex than many realise. EUROShoe update: Is mass customisation for footwear a reality? Mass customisation has often been referred to as one of the possible 'paths of salvation' for the footwear industry. Is this the reality? Whilst many organisations serving the footwear sector have struggled as a result of the major changes that have impacted the industry, the SATRA technology Centre in the UK has continued to thrive. The primary aims in die-cutting are quality, economy, and output. No matter how accurate the shape of a die or the strength of its construction, the key factor is the quality of the rule die steel (RDS) strip that is used to make it. Selecting the correct RDS profile and dimension for a specific application is therefore critical. Robots are becoming more commonplace in modern shoe factories. DESMA GmbH has been working on robotic processing of PU for footwear for many years and now has robots for more than 20 applications. SATRA has a long history of assessing specialist footwear against the effects of heat and flame. Since the introduction of European Personal Protective Equipment (PPE) Directive 89/686/EEC, it has been at the centre of the development of safety and specialist footwear standards. This Grey Scale is for assessing changes in colour of leather in colourfastness tests, for example, wash fastness, perspiration fastness, etc. Using an innovative new technology, the Esjot Group, part of Texon International GroupLtd, has produced a toe cap using an aluminium alloy which has some real advantages for both the producer and wearer of safety footwear. The foot is considered to be the oldest part of the human body as it has not changed its function, and therefore its structure, for over three million years. However, the last 100 years have seen considerable changes in the types of surfaces we walk on. The properties of leather are well-known to footwear manufacturers. Both leather and footwear have evolved technically, so what opportunities or problems are there for the footwear industry due to advances in leather? RP or Rapid prototyping is a technique which creates a facsimile of an object without needing the tooling associated with making the real version. Running shoes are at the forefront of footwear technology and are particularly effective in cushioning shock. Can producers of other types of footwear learn something from this? Leather has been used to produce footwear for over 30,000 years, but it is a natural material and is therefore full of flaws and this leads to waste. Nesting the leather well is therefore essential. It is possible to run EVA injection and rubber compression moulds and only have to clean them a couple of times a year, the situation with PU is very different. Small children's footwear should fulfil three criteria: aesthetic appeal, protection and support whils stnading or moving. They also fall into three main age groups. A detailed search of test methods reveals an enormous range of tests applicable to finished leather. CTC in France has conducted a study of children's footwear by testing the products available on the French market. With a move towards innovation rather tan mass production in developed countries, some very clever technologies are emerging - one such technology is d3o. Produced under an exclusive patent by Reltex at the foot of the French Alps, what distinguishes Lactae Hevea soles from ordinary crepe or latex rubber soles? Italy's Elio Zago specialises in creating difficult moulds, particularly those for safety footwear. What is natural about footwear? Whilst comfort can be quantified to some extent, how does one explain the term 'natural'? Tennis shoes, like the game itself, have come a long way. French testing centre,CTC, outlines some of the requirements of tennis shoes for both the amateur and the professional. A look at the changes to European and international standards. The two main areas of development at SIMAC were CAD and continuous cutting. More than ever before, shoemakers are seeking materials that are both innovative and hard wearing, as well as fashionable. As a result special product and care properties are reinforcing the trend towards innovative synthetic upper materials. When one uses the term 'release papers', most people would probably struggle to think of examples. This is despite the fact that they form a facet of everyday life in both industrial and personal environments in the form of self-adhesive labels, adhesive tapes, bakery paper, insulation material, etc. High heels: Is this the answer to an old, old problem? The Insolia System for ladies' footwear could maybe offer a successful approach to dealing with the discomfort and problems caused by wearing high heels. The change in markets and the globalisation of the footwear industry has left its mark. Product ranges and choices have increased as the market has changed from a producer driven one to a consumer driven one. Comfort in footwear is an old conundrum. How do you define it? Well, it basically falls into two main areas. PFI in Germany has more than quadrupled the number of tests it offers in the past five years. Due to ever increasing regulation, manufacturers are now more willing to test shoes than ever before. As globaliisation of the footwear industry has become a reality, and has caused problems in Western producing countries, the new technology to have arisen from this is far from a negative step. We all know the classic moccasin-based boat shoe. It has been around for over 20 years and has become a popular casual style worn close to water or on the city streets. Footwear for the true sailing enthusiast, however, has moved apace and is now a highly specialised sector of the market. Dr Markus Scherer, Head of Physical Laboratories, PFI Test and Research Company offers a way through the labyrinth of test methods now used in the EU. Just as the footwear industry has changed over the last decade, so too has the need for computer-aided design. There is now a wide choice of suppliers and also a myriad of factors to be taken into account. Shoe upper patterns are not only critical for the manufacturing process, but have a profound effect on the comfort and wear. The reduction of Fluorinated gas emissions is a requirement under the Kyoto Protocol. A recent EC directive aims to create a 20% overall usage by 2010. One area to be affected is gas-flled sports shoes. While the world's footwear industry has overwhelmingly adopted cutting tables, one major production centre - India - has not. The past few years have seen an increase in the size of footwear ranges but a reduction in model or colour. This has led to higher production costs and increased customer influence on design. One problem caused by this is colour changes when moulding TPU. How footwear manufacturers can help minimise the risk to those living and working in the theatres of war. Where is the footwear industry going and what does this mean for the future of polyurethane soling?